I am not in the habit of advertising commercial products, but I have something to recommend to anyone with the slightest inclination of playing the guitar, or wants to take a guitar on a vacation or camping, not wanting to take your GOOD guitar. Before I make my recommendation, know that there are an incredible number of traditional nylon as well as steel stringed guitars available for under $300. Traditional guitars are probably better to learn on. But in our recent trip to Hawaii I really wanted to bring my guitar along. Daniel burned the image of my Martin HD-28 tumbling down the baggage conveyor belt in shreds. 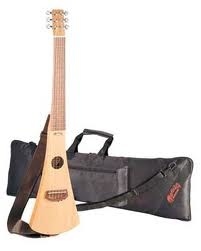 I suddenly remembered seeing a peculiar guitar on the wall in the Guitar Center recently: the Backpacker guitar. I went online to find it was $169 plus shipping, and for $19 I could get a replacement if I damaged it. This is a Martin guitar. All for under $200. SOLD! I had it shipped to Hawaii to our vacation destination and it was there on day two. I love it. I took it home as a carry-on with no hassle from the flight crew, except the Honolulu Xray dude shouted after me with delight: A BACKPACKER guitar! My only criticism was that the instrument smells slightly like fish. I’ve cleaned it twice and changed the strings, but there is still a slight smell. I’m going to make a pomander dangle for it, and make it smell like clove-Meyer lemon instead. The sound is a little thin, which is not surprising for a skinny guitar like this. It plays best using a strap, holding it the traditional way doesn’t quite work. Once you get the feel of the guitar, it plays really well. I’ve since discovered some other travel guitars (do a search on Amazon) all less than $200.